The buzzing locale of Indiranagar is famed for its microbreweries, shopping scene and restaurants galore, but walk into the little bylanes off the arterial 100 Feet Road and you will find yourself in the fine company of plenty of charming cafes in the area. Ideal for a little more than just coffee, cake and conversation, whether you want to work, grab a bit or read a book these cafes offer plenty of good taste and character that are not just limited to their menu. This is technically not a cafe, and the prices are definitely not cafe prices. But Cafe max does showcase a very cafe-like vibe with a rooftop (Goethe Institute aka Max Mueller Bhavan) setting, an elaborate dessert bay and being able to take advantage of Bangalore’s lovely weather. Cafe Max serves delicious German fare with some Mediterranean choices thrown in, plus a selection of wines. Apart from steaks, pies, hearty breakfast, you need to save stomach for dessert as well. Don’t leave without trying the German Cheesecake or the Apple Strudel, or maybe both. A boutique, with a selection of artisan brands encouraging North East fairtrade – make your way upstairs to a rustic setup under a canopy. Popular for their teas, enjoy the Kashmiri Kahwa if it is in season or the apple cinnamon, of course there are the regulars like the masala chai and ginger. A cafe that is also famous for breakfasts, enjoy the traditional continental favourites like French toast, waffles, pancakes, omelettes and more. If you want a place of zen that reflects it in their ambience or food, look no further. Yogisthan is an earthy alfresco setting, with calming colours and a menu that caters to vegans as well, keeping in the mind Ayurvedic principles. Try the detoxifying quinoa burger, the chickpea crepe, or their signature ten grain bread toast with ghee and jaggery. You could have the choice to pop in for their yoga classes, and follow it up with a round of medicinal tea or their blended coffees. A quaint little bungalow that looks like a fairy tale bakery, Glens has a built a name around itself for its red velvet cupcakes and their stone fire pizzas. From delicious breakfast options like cinnamon rolls and baked beans to a menu of soups, salads, pasta and pizza, Glen’s Bakehouse serves up homely food with a budget friendly pricing. We like wolfing down their mini red velvet cakes by the dozen too! Staying true to the name, the dedicated list of teas here will have you spoilt for choice. From Oolongs, green tea to black teas and herbal — there is much to try, and their tisane or flower teas. The menu also recommends the ideal tea to pair with your dessert, for instance the salted caramel apple pie goes well with the rosehip and hibiscus, or the Egyptian peppermint tisane tea goes well the Belgian dark chocolate cake. The latest addition to the block, this boutique patisserie is reminiscent of a European cafe with a display of gorgeous desserts. The dessert menu has decadent vanilla bean cupcakes to pina-colada inspired pastries and frosty ice teas. If you are in for a savoury treat, pick from their selection of pizza, salads, pasta or Asian dishes. They do gourmet chocolates and even beautifully plated desserts such as the Coco Indiana, rainbow slices, and have one of the best hot chocolate's we've ever had. A classic cafe (or a coffee shop), this is the best place to sit back and work, read, chill or all of the above. Matteo’s interiors are reminiscent of New York vintage vibes — serving the usual cafe nibbles, but the coffee is what deserves the spotlight. From hazelnut lattes to caramel cappuccinos, the menu is every coffee aficionado’s dream. Plus, they do a decent hot chocolate too. The bright yellow walls and the blue doors of this cutesy cafe is hard to miss on Indiranagar’s 80 Feet Road. Lazy Suzy is a cafe to while away time, with endless conversations. The decor has dreamy blues, lilacs and mellow yellows along with illustrations of a snoozing cat (we guess that’s Suzy), the menu has a continental selection, from alfredo pasta to pizza. 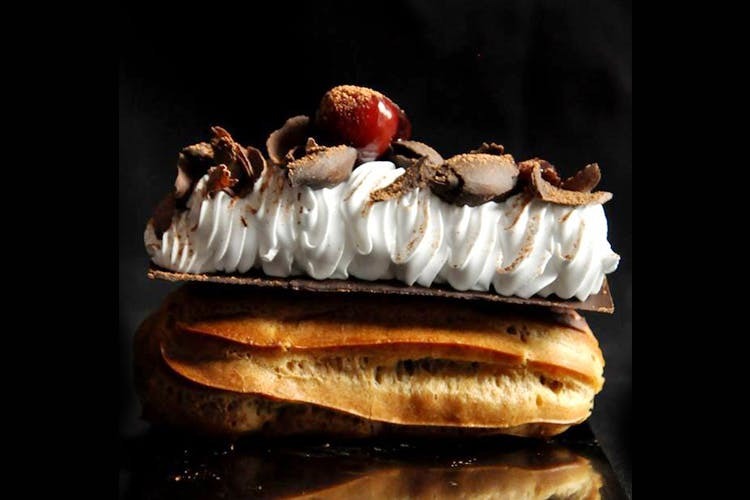 They have a bakery, with desserts such as tiramisu, apple pie and the Suzy’s three texture cake — layered with dark, white and milk chocolate. They also have free Wi-Fi! Though really a baking academy, Lavonne has a tiny Parisian style cafe right inside the property and offers delicious buttery croissants, sinful pastries and sweet macarons. Perfect to go with your tea or cappuccino. For a sugar high, we recommend the plated desserts here like their Molten Lava Cake or Coconut Key Lime Pie. The menu here is inspired by Enid Blyton’s world of fairies, pixies, and goblins. The cafe offers really charming wooden chairs and mismatched tables. A range of vegetarian salads, sandwiches, flat breads and pastas are available, along with desserts and beverages. They also do big portioned desserts such as the Red Velvet Cake or the dark chocolate Rocky Road Cake. Tea lovers, try Jug Mug Thela’s interesting tea mixes with lavender flowers, rose petals and Kinnow peel.